An anaerobic, or methane, digester serves three purposes. First, the digester breaks down organic waste. Second, the organic waste decomposes and gives off methane gas that can fuel different systems or heat homes. Third, the fluid byproduct of decomposition can fertilize a garden. By breaking down organic waste into fuel and fertilizer, the amount of remaining waste to be disposed of is reduced significantly. All it takes to make a methane digester is a 55-gallon drum and some common tools. A steel drum makes an excellent methane digester. Clean a 55-gallon drum. 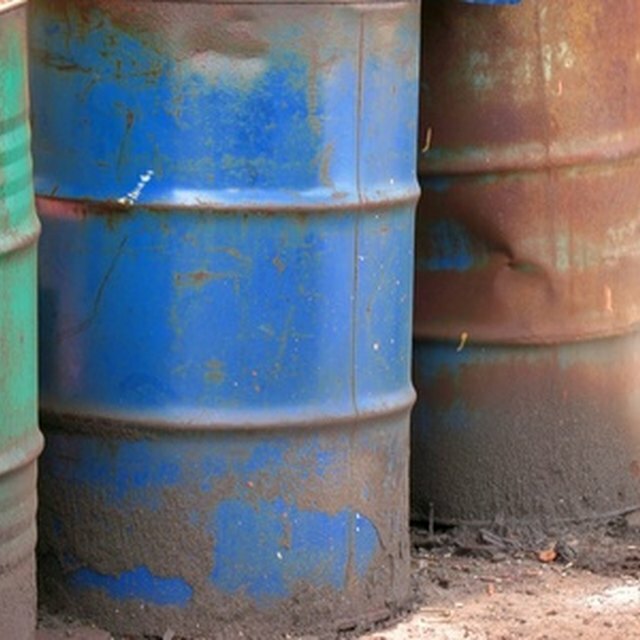 If the drum was used to transport chemicals or petroleum products, you must choose another one. Chemicals interfere with anaerobic processes, and make the gas dangerous and the fertilizer poisonous to plants. Use a drum that transported vegetable oil or other food-grade products. Set the drum up on concrete blocks, and fill with dry wood. Burn the wood at the highest heat possible so that food-product residue is incinerated. Drill a 3-inch hole in the center of the drum lid with the 3-inch circle attachment. Measure 1-inch from the left side of the drum, and use the small circle drill bit to make a 15-inch hole in that location. The first hole will be the input pipe for organic matter, and the second for the release of the methane gas. Measure 2 inches up from the bottom of the drum, and drill a 15 inch hole for the spigot, which will release the liquid fertilizer for use in the garden. Place the O-ring over the 3-inch hole in the lid, and set the PVC collar over the top of it. Drill the four bolts into the holes in the collar lip to secure it to the lid. Insert the PVC pipe into the collar, and set the lid on top of the drum. Adjust the size of the pipe inside the drum so that there is a 2-inch clearance between the bottom of the pipe and the bottom of the drum. Organic waste will be tossed into the pipe and pressed down into the drum. Mark this location on the PVC pipe. Apply PVC cement to this mark around the circumference of the pipe and twist the pipe into place in the collar. Fill in the space between the collar and the lid with silicone sealant. Place some silicone sealant around the edge of the pipe and collar too. Set the lid and pipe assembly aside to let the sealant dry. Insert the spigot into the hole on the bottom of the drum. Seal the edges with silicone sealant on the inside and outside of the spigot. Let the sealant dry overnight. Fill the drum halfway with water, and test the spigot to see if there are any leaks around the edges. Insert the pressure release valve into the small hole in the lid. Secure the valve to the lid with a nut and bolt. Close the valve and leave it closed tightly. Seal around the edges with silicone sealant. Place the lid on the drum, and screw one of the end caps on the top of the pipe. Drill a 1/8- inch hole in the center of the second end cap. Place this second end cap with the flat side down on a workbench. The end cap resembles a wide cup; place the 3-inch circle drill inside the "cup". Cut through the end cap and remove the cut circle. This circle will be attached to the rod to make a "masher" to force organic waste deep into the pipe. Screw a bolt onto the end of the 4-foot threaded rod, one-half inch from the end. Place a washer over this bolt, and set the circle you just cut from the end cap on top of the washer. Place another washer on the rod and then another bolt on top of the washer. Tighten the bolts, if necessary, with a socket wrench. This will be your organic waste masher. Organic waste placed into the PVC pipe will need to be mashed down to keep the pipe clear. The methane gas builds up in the area inside the drum surrounding the pipe. Remove the PVC end cap from the lid of the drum, and add 2 gallons of water to the drum. Pour the bacterial starter kit into the water. The enzymes in a septic tank treatment formula will cause the production of methane gases and break down organic matter into fertilizer. Screw the PVC end cap back on. Place the metal lid seal around the top edge of the drum and snap it into place. This will be the metal seal that holds the lid tightly to the body of the drum. You can now begin adding organic waste to make fertilizer, methane gas and reduce your organic trash. Where Can I Find Plastic Drums & Barrels?